This "whale holiday" sign was spotted in Kihei a few years ago. Holiday Concerts at the Maui Mall Too many concerts to list separately! Maui Mall, Kahului. Saturdays in December, 12 pm – 2 pm. The Spirit of Christmas Holiday Concert Series. Queen Ka’ahumanu Center, Kahului. The Outlets of Maui, West Side. Holiday Entertainment at Lahaina Cannery Mall, West Side. December 14 – December 24, 12 Days of Fishmas. Scuba Claus is coming to town with his sidekick Elf . Special diving shows at 11 am and 3 pm plus other holiday themed activities. Included with price of admission. Maui Ocean Center, Maalaea. Through December 13, Fridays and Saturdays at 7:30 pm, Sundays at 3 pm. Elf the Musical. Back by popular demand. Iao Theater, Wailuku. $20-40. FirstLight – Maui Film Festival– 10-12 more films will be shown in December, dates and times TBA. More info here. For a list of other ongoing events, which are held monthly, scroll to the bottom. Tuesday, December 1, 5pm – 8 pm. Hui Holidays: First Night Celebration. The grand opening of holiday shopping at the Hui No’eau, replete with music, drinks, and pupus. $30. Hui No’eau, Makawao. Friday, December 4, 7 pm. The Merwin Conservancy Presents Susan Casey in the Green Room. MACC, Wailuku. $35. $10/students. Saturday, December 5, 9 am – 4 pm. Waldorf School Holiday Faire. The premiere holiday craft show on Maui with keiki activities, wreath booths, crafters, food booths, and entertainment. Haleakala Waldorf School, Kula. $3, free for children under 12. Saturday, December 5, 1 pm – 4 pm. Lei of Aloha 9. Open house and benefit for Hokulani Holt’s Halau Hula, with music, hula performances, poetry reading, and light refreshments. $30. Wailuku Inn, Wailuku. Saturday, December 5, 9 am – 7 pm and Sunday, December 6, 9 am – 5 pm. Holiday Lighting of the Banyan Tree. Lahaina. Craft fair with holiday activities: cookie decorating, face painting, music, Banyan snowman, and holiday lighting of the banyan tree at 6:30 pm on Saturday. FREE! Saturday, December 5, First Annual Project Gift. 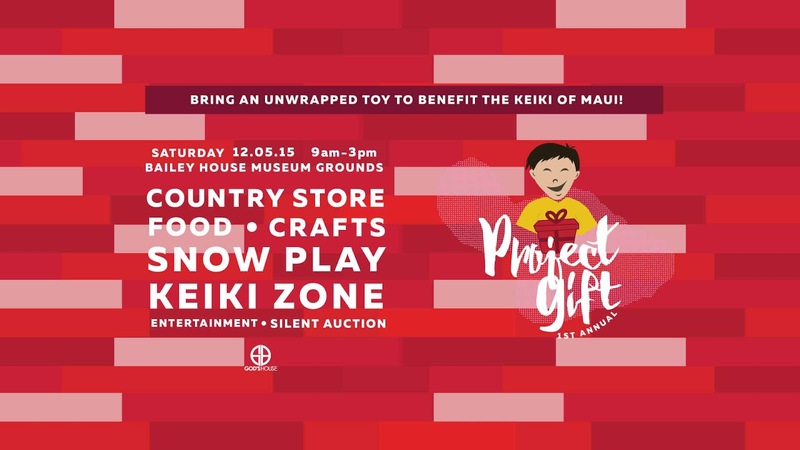 Holiday Fair and event to benefit Maui keiki. Fun activities for kids and adults, but please bring a gift for a child or make a donation. Bailey House Museum, Wailuku. FREE (but donation of a gift requested)! Sunday, December 6, 9 am – 3 pm. Kula Winter Harvest Festival. The date changed from November, so the annual Kula Harvest Festival will have a winter theme. Kula School, Kula. Sunday, December 6, 3 pm. Maui Pops Orchestra. Holiday Pops Concert. MACC, Wailuku. $15-50. Sunday, December 6, 3 pm and 6:30 pm. Wild Brews. A wild food, fermentation, and Japanese fusion event. Enjoy Japanese plant-based cuisine, wild food by Sunny Savage, and kombucha. Choice Health Bar, Lahaina. $60. Tuesday, December 8 - December 13. BMI Maui Songwriters Festival. Intimate shows and energizing concerts by songwriters sharing songs and the stories behind them. Locations and admission prices vary. Some events are free. Saturday, December 12, Annual Holiday Tree Lighting at Ulupalakua. 4:30 pm – 7:30 pm. Enjoy the lighting of a holiday tree, craft booths, food booths, activities for the kids, and an outdoor movie after sunset. Maui Winery, Ulupalakua. Admission is free, but please bring a food donation to the Maui Food Bank. Saturday, December 12, 8 pm. Mele Kalikimaka Keiki O Mau'i. Holiday concert with Anuhea to benefit Maui keiki. Bring an unwrapped toy for a child. Mulligans on the Blue, Wailea. $20 + a toy. Sunday, December 13, 2 pm – 4pm. Haliimaile Community Garden Holiday Party and Potluck. FREE! Haliimaile Community Garden. Sunday, December 13, 10 am – 4 pm. Jungle Pop Up Bazaar. Holiday shopping of handmade gifts and treasures. Pauwela Cannery, Haiku. Sunday, December 13, 8 am – 2 pm. 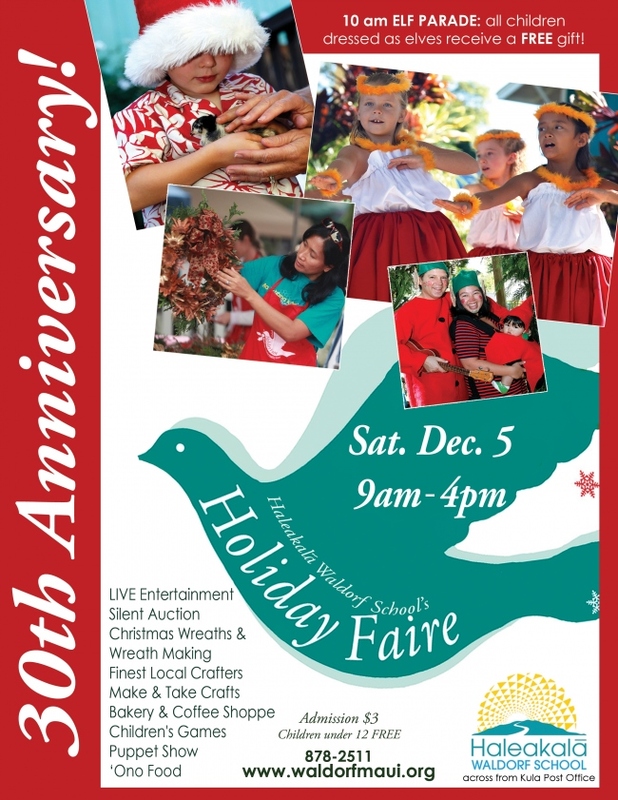 Holiday Crafts at Keokea Marketplace. Just past Grandma’s Coffee, Kula. Saturday, December 19, 7 pm. Nā Leo Lani O Maui's 7th Annual Holiday Concert. A Maui favorite with holiday songs and Hawaiian performances. Seabury Hall. $22-30. Monday, December 28, 5:30 pm. Japanese New Year Traditions and Dinner, Japanese Cultural Society of Maui. Learn about Japanese New Year and pound mochi, a sweet rice dessert. $10-15. Wailuku. Saturday, January 23, 5 pm – 8:30 pm. Buy Back the Beach – Hawaiian Island Land Trust Annual Gala Event featuring Grammy award winner John Cruz, dining under the stars and silent auction. Lahaina. http://www.hilt.org/malama-kipuka-buy-back-the-beach-gala-maui/ $175. www.calendarmaui.com, www.mauitime.com, www.meetup.com. Go Hawaii. 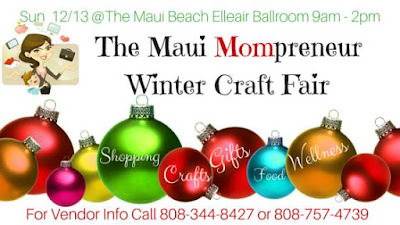 Also, for the holidays, check out Maui Merry Christmas on Facebook, with more events and holiday ideas for Maui.